Buy 24 or more for $8.54 each. Ruth Logan Herne, the bestselling author of Welcome to Wishing Bridge, invites readers back to the small town where big dreams come true. Her partner, Dr. Ethan Brandenburg, has his own struggles: caring for his orphaned niece and nephew and holding firm to his decision to leave Wishing Bridge for a prestigious job in Chicago. Though Thea’s no-nonsense advice in the office has been good for business, her compassion in Ethan’s personal life has been good for his heart. But how can he offer a commitment to a woman when they’re both about to say goodbye? Wishing Bridge may be surrounded by forests and farms, but Thea is starting to realize that friendships and family form its heart—and that what she wants in life and love may be right in front of her eyes. 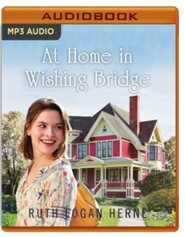 Ruth Logan Herne is the bestselling author of more than forty novels and novellas, including Welcome to Wishing Bridge, the first book in her Wishing Bridge series. With millions of books in print, she’s living her dream of touching hearts and souls by writing the kind of books she likes to read. The mother of six and grandmother to fourteen, she loves God, family, country, chocolate, and dogs and lives with her husband on a small farm in Upstate New York, where she can be found prepping chicken eggs for local customers—who know not to say too much (or they just may end up in a book). Visit the author at www.ruthloganherne.com. I'm the author/artist and I want to review At Home in Wishing Bridge.